It was a convenient stop over on our trip down South. Good facility for a dog with easy outside access. Le lit était grand et agréable L’isolation sonore était parfaite (la double porte doit apporter beaucoup) Quel plaisir d’être dans le noir complet ! L’accueil du personnel, le bâtiment restaurant, les repas. la possibilité de garer un utilitaire dans un enclos fermé. la courtoisie du gérant qui nous a accueillis. Hôtel au calme. Le personnel d'accueil très sympa. et disponible. Le petit déjeuner très bien. La grandeur de la salle de bain et de l’eau chaude a 22 heures !!! l'emplacement à proximité de tout, l'accueil agréable, le parking gratuit, le confort de la chambre, l'emplacement de la télévision bien située lorsqu'on la regarde du lit, et la propreté. Chambres propres, calmes. Suite à une erreur de double prélèvement de CB, la personne de l'accueil nous a bien aiguillés pour les démarches de remboursement et a été très prévenante. Le remboursement nous a été fait dans des délais très corrects. Situated just outside Vert-Saint-Denis, to the north of Melun, in the south eastern suburbs of Paris, about 25 miles from the heart of the city, it is easily accessible from the highway. Campanile Melun Senart - Vert-Saint-Denis is easily accessible, as it is near the A5 highway as well as other major roads that will connect you to Paris. Offering excellent value for money in a convenient location, the hotel is a great option if you are looking for a stopover while traveling through the Île-de-France region of France. During your stay you have the options of either walking through the nearby forest, taking a trip into the center of Paris, or even enjoying a day at Disneyland Resort Paris - all are easy to get to by car. This property also has one of the top-rated locations in Vert-Saint-Denis! Guests are happier about it compared to other properties in the area. This property is also rated for the best value in Vert-Saint-Denis! Guests are getting more for their money when compared to other properties in this city. 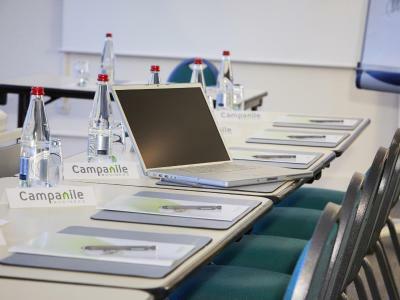 When would you like to stay at Campanile Melun Senart - Vert-Saint-Denis? These rooms feature free Wi-Fi access, a private bathroom and a TV. House Rules Campanile Melun Senart - Vert-Saint-Denis takes special requests – add in the next step! Campanile Melun Senart - Vert-Saint-Denis accepts these cards and reserves the right to temporarily hold an amount prior to arrival. Late arrivals: Guests must arrive at the hotel prior to 22:30. Your room cannot be guaranteed after 22:30. If you cannot change your time of arrival, please contact the hotel prior to 22:30 local time. Only pets under 10 kg will be accepted (1 per room and subject to availability of rooms where pets are allowed.) 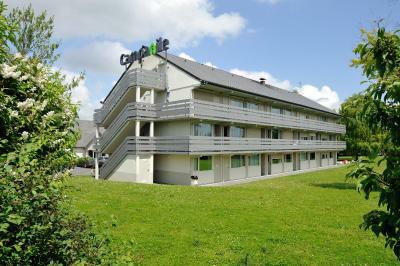 with a supplement of EUR per night. For hygiene reasons, animals are also prohibited in the restaurant or breakfast rooms during service hours. No plugs in the bath or basin. Very dreary. We got there at 1pm and had to wait because you could only checked in at 4pm. Although we sent an email about checking it early, nothimg was done.Next door, there is premiere class, and people could have checked it before 12. Room was spacious and comfy, bed was very good. The restaurant was closed and we had had no warning of this. Have stayed in Capanile Hotels before, but felt this one was not up to the usual standard.